Now that January is well under way, those considering selling their home may want to read on and get a head start on how to prep your home for listing. For most of us, when it comes time to selling our home, we are perhaps more concerned with ‘where do I start’ on clearing out the 15 + years worth of clutter we have accumulated than anything else. But how many of us really look at our home through the eyes of a buyer when preparing to put it on the market? 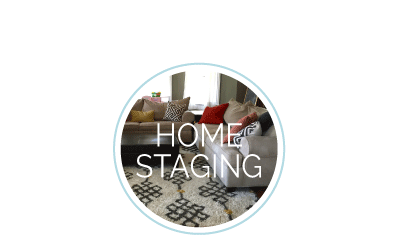 In order to get a house sold for the right price and quickly so it doesn’t sit on the market for months and end up with a price reduction, you might consider hiring a staging professional for what I like to call a “Pre listing prep” consultation (your agent should be able to help you find a local Stager or you can do search on Houzz). For a small fee (in comparison to your R.O.I) it is well worth some consideration and will certainly put your home in the fore front of a buyers mind at the open house, not to mention boost your chances against any local competition. Here is the breakdown of what to consider and how it can really help the homeowner and agent with selling the home. Firstly I like to look at the property from the front and see what kind of Curb appeal is going on. We are looking for a ‘wow’ factor and to create a lasting good first impression. For me one of the first things a homeowner can do that really makes a difference, and I stress this on nearly every consult, is power washing. We often neglect the exterior but it’s so important for selling purposes. Once we have cleaned thoroughly we can start thinking about other things like color, condition of front door, roof/siding, light fixtures, mailboxes, landscaping – is the house hidden by overgrown plants/shrubs. 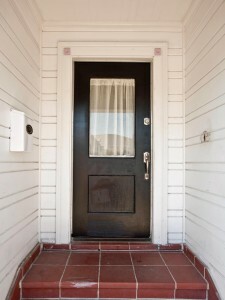 Is there an inviting welcoming appearance leading up to the front door (pathways, driveways etc do they need repair?) Take this photo for example, see how hidden the house is by all those overgrown bushes. The house is lost not only by foliage but by color too, adding a splash of color to the front door makes it more appealing. 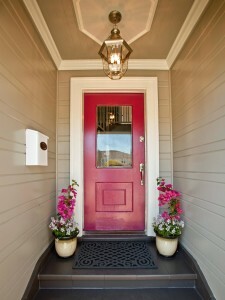 A few well placed seasonal planters, some color and a new light fixture can make a huge difference. The next is the entryway and the first impression of the interior. Smells would be the first thing you notice and are a big turn off, weather you have pets or love to cook lots of spicy food, the potential buyer may not, this is something that a Stager can help you fix. Another very important factor to consider before you tackle the painting are small repairs and DIY issues. That switch plate that is hanging off the wall may not bother you but its says extra work to the person looking at your house. A stager will go through every room looking for any slight signs of neglect and areas that need attention. Personally if I were a buyer and viewed a house that had maybe 3 or 4 things that needed attention – small cracks, paint chips, holes in the sheetrock etc, this is like a red flag. If this is what I am seeing what else is going on in the house that I can’t see. It shouts neglect, more work and money and I walk away form the open house with a negative feeling. This is not want you want. 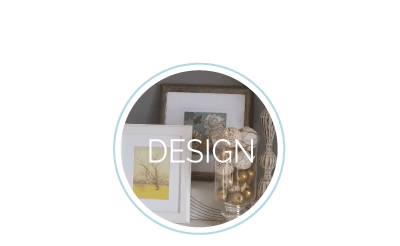 Overall we are looking for bright/light interiors that are warm and welcoming with well placed furniture and accessories which present the buyer with the idea that this is where they want to live. You really don’y need to spend a fortune renting furniture (unless the home you are selling is vacant of course) most homes have more than they need and actually should probably have some removed before the open house. 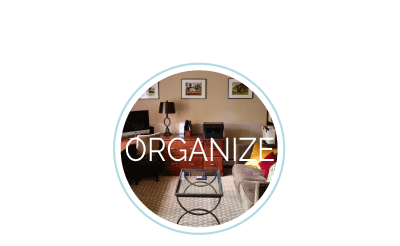 Smaller homes can look cluttered and claustrophobic with too much big furniture in them. On the flip side, a larger home can also be a problem to a buyer if they can’t picture where their things will go. Help them by being obvious about what the rooms are intended for and pay attention to how the home will be listed, (you can discuss this with your agent). Decide who your potential buyer is (local demographics etc) and tailor your home accordingly. Does it make sense to turn your office back into a bedroom if your existing 4 bedroom home will be listed as a 5 bedroom etc. All important things to consider. There are certain rooms in a house that can make or break a deal and kitchens are one of them. There are some things you can do without spending a fortune that will have a positive effect. Cabinets, countertops and backsplashes are your main areas of focus as these are the things that primarily show that a kitchen is outdated. While the countertop is probably going to be the most expensive splurge – but even here you can get great deals on end of lines or by searching your local Habitat for Humanity Restore. You can save on the other two areas with inexpensive tile and newly painted cabinets. If you can do most of the work yourself or get the help of a friend or family member this will all help with saving money. I always like to explain to my clients that if their home is priced similar to another home of comparable size in your local area, you want your house to be the one that shines and stands out form the competition. We do that by spending a little time and a little money to get the best return on one of your biggest investments. So if you are wanting to put your home on the market this Spring now is the perfect time to start your ‘Pre listing prep’ and get ahead of the game.